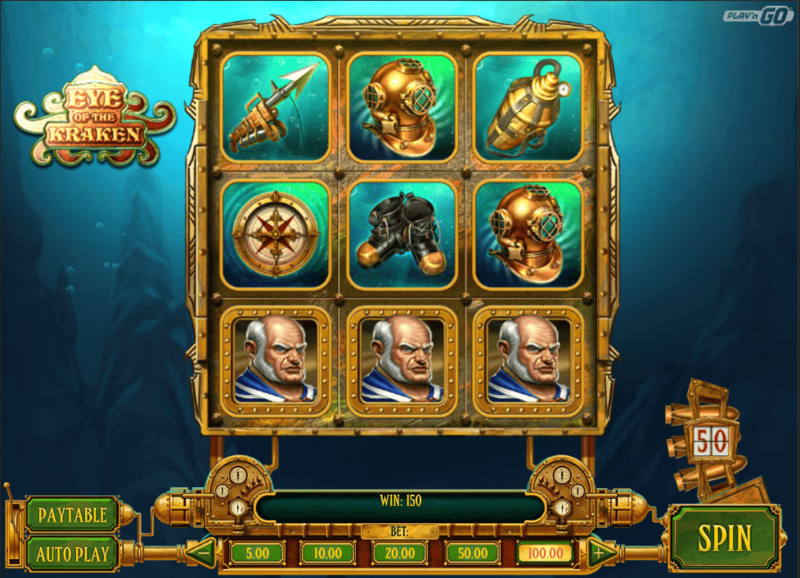 This slot is themed on the legendary sea monster that is said to dwell off the coast of Norway and Greenland. A lot has been said about the Kraken but what stands out from the many myths is the fact that it was a giant creature. Any seafarer would not want to come across has it had the power to wreck havoc on any ship no matter how big it was. The game is set in the cold, dark waters of the northern sea where you will not find any brightly colored coral or some friendly dolphins. Here the Kraken is the ultimate force any anything that comes by is destroyed. The Kraken has destroyed mighty ships filled with hordes of treasure, and it is your goal as a player to locate the Kraken so as to find the treasure horde. There are different types of symbols in the Eye of the Kraken Slot Machine but unlike most other slots here you will not find the high playing card icons. The symbols in this slot are the equipment that you will need to stop the mighty Kraken and the three main characters that are on a mission to uncover the mysteries. Besides from the symbols the playing panel is very simple and once you have the symbols figured out you will have little to no problem playing this slot. The control panel or playing buttons are located just below the reels, and they are as straightforward as they can be. The SPIN button is the leftmost button on the reel while the BET button is in the middle. There is also an AUTOPLAY button on the bottom left of your screen. · Dive Mode: This is the free spins feature in the game, and it is triggered when you get a minimum of 5 divers’ helmet on any position on the reels. Getting five divers’ helmet symbols will reward you with nine free spins. During the free spins, the aim should be to get as many treasure chests as possible so that you can gain a multiplier. · Torpedo Meter Collection: There are torpedo symbols that appear randomly, and you are required to collect at least 50 of them so that you can trigger the Conquer the Kraken bonus game. When the bonus game is activated, you get to choose three of its tentacles that will award you with generous cash prizes. The tentacles that you choose will determine the size of the cash prize you win. · Wild Kraken Tentacles: This feature is triggered randomly, and when this happens the Kraken’s tentacles wrap around the reels and create wilds wherever they land on the reels. This is a very cools feature, and it can lead to some decent wins. The highest payout in this game is 500 times your bet amount. This means the more money you wager, the higher the amount of your potential payout. If you bet on the maximum amount possible in the game, you can win up to 50,000 coins in a single spin. Just like any other slot your luck and consistency of play is the two things that influence your chances of getting the maximum payout. The Eye of the Kraken is a very entertaining game that is worth trying out for any player. There is a real opportunity of making a fortune from playing the game and with many special features available in the game a player can expect an adventurous time. 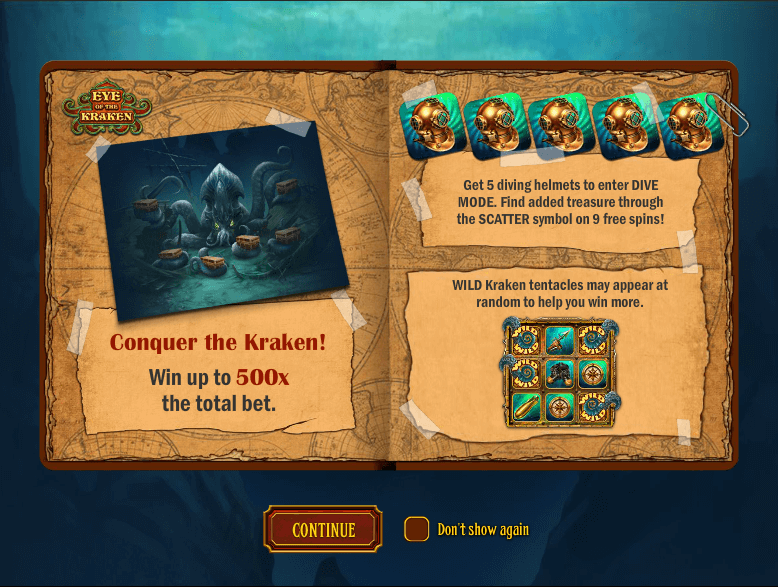 Eye of the Kraken Slot Machine is available for play in more than 100 online casinos. However, if you want to stand a chance to win real money the top two casinos for this game are Vegas Paradise and Jackpot Paradise. There are several things that make them the best for this slot and any other slot. These factors include excellent customer support and the ease of making deposits and withdrawals. However, the welcome bonus of $200 and 10 free spins at both casinos is perhaps what most players will love most at Vegas Paradise and Jackpot Paradise.